When living on Mars, if anything breaks down you can’t run out to the hardware store to pick up a new part. 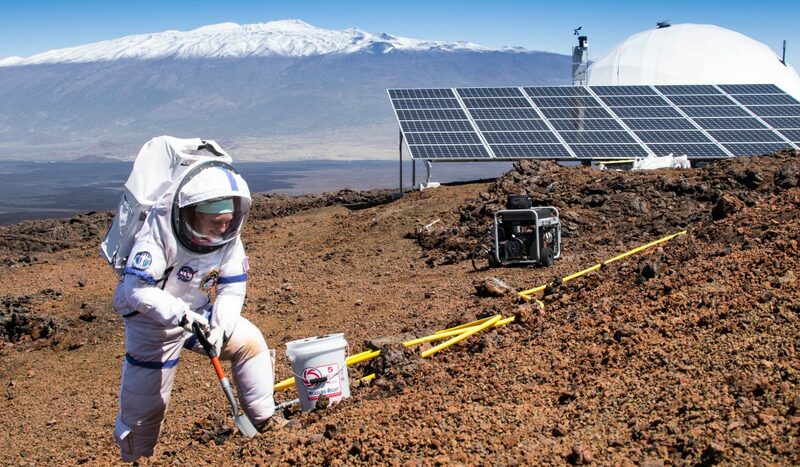 On Saturday, June 2nd at 3:30pm in the Speaker Series Lounge, Martha Lenio will share some of the trials, challenges, and creative victories from her time in the HI-SEAS Mars mission simulation in Hawaii. Born and raised in Waterloo, Ontario, Dr. Martha Lenio has had a life-long interest in both space exploration and environmental issues. She has worked in the sustainable building industry, the photovoltaics industry, and academia. Her experiences have included teaching math and science in Ghana, doing a PhD in photovoltaic engineering in Australia, and being a university lecturer. From 2014 to 2015 she commanded an 8 month Mars simulation with the Hawaii Space Exploration Analog and Simulation (HI-SEAS), funded by NASA. Last year she made it to the final 72 candidates of the Canadian Astronaut Selection process. She has founded her own company, Mars Green Consulting, focused on renewable energy consulting and smart grid design. She also works for WWF-Canada on an Arctic Renewable Energy project focused on bringing green energy to Nunavut. Martha earned a Bachelor of Applied Science in Mechanical Engineering from the University of Waterloo in 2004, and completed a doctorate in Photovoltaic Engineering from the University of New South Wales (Sydney, Australia) in 2013.